The SERPENT website has been refreshed to a new streamlined format. We have integrated the SERPENT twitter feed and YouTube accounts, which we are increasingly using to highlight the SERPENT footage. We have also created an interactive mission map, based on Google Maps. We hope you like it. In March we carried out a further visit to the Transoecan Spitsbergen at Hurricane Energy's Halifax well west of Shetland. Poor weather limtied the ROV diving opportunities but we did manage some time-lapse camera deployments and photographic surveys. Highlight images from the work on the Transocean Spitsbergen in 2016 and 2017 are available on the SERPENT database. 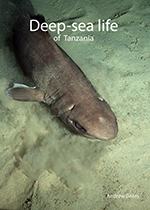 The SERPENT Project has produced a new photographic guide to the deep-sea organisms found during ROV surveys at hydrocarbon drilling sites in the western Indian Ocean off Tanzania. The guide is based on 7 field visits to sites ranging from 1300-2600 m water depth to work with ROV teams on board the Ocean Rig Poseidon and Deep-sea Metro I drilling rigs. Some of the best footage was obtained outside of scientist visits, when ROV team was going about their regular business. Including this amazing footage of the deepest ever record of a scalloped hammerhead. We used a variety of methods including ROV video survey, baited time-lapse camera deployments and sample collection to gather the data for this project. Further details are available here and many of the observations are recorded in the SERPENT database. Copies of the guide have been provided to stakeholders in Tanzania.